The Duchess of Cornwall had her dancing shoes on during her latest royal engagement. Source: Getty. The Duchess of Cornwall is often praised for her willingness to have a go at something new whilst on royal engagements, and Camilla’s latest outing saw her take to the floor at a Jewish community centre in London. Camilla visited Jewish Care’s Brenner Centre in East London on Wednesday to mark the facilities’ 80th anniversary, and the duchess wasted no time in getting involved with the festivities. Taking to the floor with Labour peer Lord Levy, a Jewish member of the UK’s House of Lords, Camilla danced to ‘Hava Nagila’, an Israeli folk song that is traditionally sung at Jewish celebrations. Video footage shared on social media by Daily Mail reporter Rebecca English shows “great sport” Camilla taking the hand of an 86-year-old, who later told the royal reporter that he “wouldn’t sleep” after dancing with a member of the royal family. Read more: Camilla and Prince Charles match in tartan for visit to Scotland. Camilla looked regal in green for the solo engagement as she stepped out in a tailored two-piece suit, made up of an A-line skirt and fitted blazer jacket, which she brightened up with a silk patterned scarf. She completed the look with a delicate golden brooch, in the shape of a horse shoe, and a pair of black tights to keep warm in the bitter British weather. Later in the day, the Duchess of Cornwall also took part in a community clean-up with charity Cleanup UK, which was founded in 2007. Camilla was gifted with a pair of personalised litter pickers to pass on to Prince William and Prince Harry, after the pair revealed in an interview last year they were made to pick up rubbish by their father Prince Charles. She then met two police horses who were out on duty. 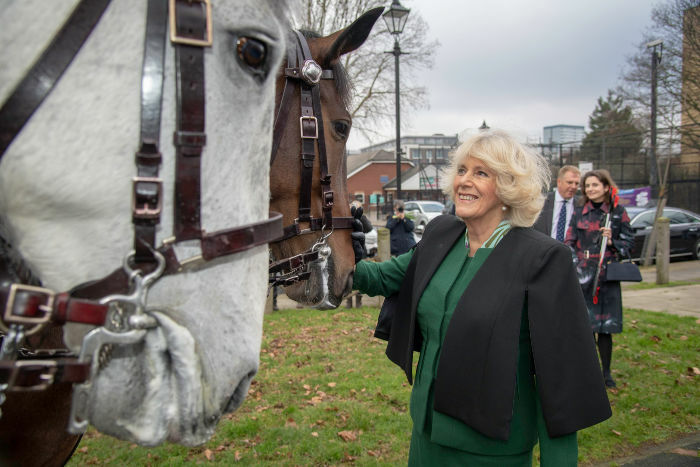 Known for her love of horses, Camilla stopped to stroke the pair, one of whom was a four-year-old horse in training. “He’s got a lot to learn,” Camilla said to the horse’s police handler. After quizzing the two officers about their beat, Camilla then fed the pair of horses a mint each – before being invited to wipe her dirty leather glove, which had been slobbered on, on the horse’s mane. Do you think Camilla is a good sport? What do you think of her dancing?